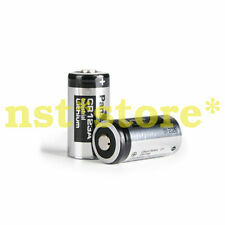 CR123A - 500 mAh. Lithium-Ion Battery (Li-Ion), 3 VGoobay CR123A - 500 mAh, Paperbox with Label - Lithium-Ion Battery (Li-Ion), 3 V. Get In Touch. 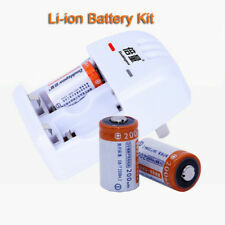 Battery CR2 & LIR 3.0V. Do not disassemble ,short circuit or dispose of in fire which may lead to leakage and explosion. Battery type Do not mix with different type battery. We take good care of every advice or complain from you. ALSO KNOWN AS:DL123A, CR123, CR123A, K123A, CR17345, 123, CR-123, PL123, EL123AP, RL123A, 5018LC, 23-155. 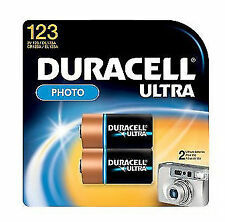 2 x DURACELL Ultra Photo Batteries. 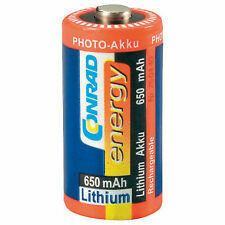 Capacity: 650mAh. Manufacturer's part:Conrad Energy CR123. Battery Type : for 3V 123A Battery (Battery not Included). 1 x Battery Holder. Note: Light shooting and different displays may cause the color of the item in the picture a little different from the real thing. Replace for CR123A, CR123, CR17345, K123A, VL123A, DL123A,5018LC, EL123AP, SF123 and SF123A. Chemistry: LiFePO4 Lithium. Battery type: for 3V 123A battery (without battery). Note: Light shooting and different displays may cause the color of the item in the picture a little different from the real thing. Features: 100% Brand new and high quality!CR123A model can replace for CR123, CR17345, K123A, VL123A, DL123A,5018LC, EL123AP, SF123 and SF123A Lasts up to 5 times longer than alkaline batteries in digital cameras and up to 3 times longer in other cameras and flash applications Advanced construction with Lithium technology Wide temperature tolerance Warning: Can Not Be Recharged! Specifications:Condition: newType: Lithium Size: CR123A Nominal voltage: 3.0 V Nominal capacity: 1600 mAh Operating Temperature Range:-20 Brand Unbranded/Generic MPN Does not apply UPC Does not apply ISBN Does not apply ISBN Does not apply EAN Does not apply. 20X(100% New and high quality Product Name : Battery Holder Battery Type : for 3V 123A Battery (Battery not Included) Body Size : 4.3 x 1.8 x 1.4cm/ 1.7 x 0.71 x 0. Features:The high capacity, small size, light weight.Stable discharge voltage.Continuous discharge rate high.The internal resistance.Non-pollution, long cycle life.Descriptions:Can be applied for camera, medical equipment, lamp, radio, eletronic lock, ectronic meter LED flashlight, steamlight and so on.Specifications:Brand: PKCELLModel: CR123ACapacity: 1500mAhVoltage: 3VSize:17mm*34.5mmQuantity: 10pcsColor: green & bluePacakge Included:10 x 1500MAH BatteryNotes:Due to the difference between different monitors, the picture may not reflect the actual color of the item. We guarantee the style is the same as shown in the pictures. If you want to buy more than 10PCS, please contact us, we will give you a bigger discount . 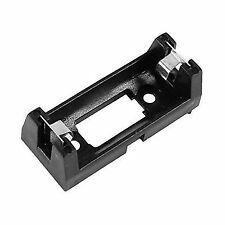 100% New and high quality Product Name : Battery Holder Battery Type : for 3V 123A Battery (Battery not Included) Body Size : 4.3 x 1.8 x 1.4cm/ 1.7 x 0.71 x 0. Battery Type : for 3V 123A Battery (Battery not Included). 2X(100% New and high quality. 1 x Battery Holder. Note: Light shooting and different displays may cause the color of the item in the picture a little different from the real thing. ). Battery Type : for 3V 123A Battery (Battery not Included). 1X(100% New and high quality. 1 x Battery Holder. Note: Light shooting and different displays may cause the color of the item in the picture a little different from the real thing. ). Battery type: for 3V 123A battery (without battery). 1X(Color: Black. Note: Light shooting and different displays may cause the color of the item in the picture a little different from the real thing. ). Battery type: for 3V 123A battery (without battery). 2X(Color: Black. Note: Light shooting and different displays may cause the color of the item in the picture a little different from the real thing. ). 2X(100% New and high quality Product Name : Battery Holder Battery Type : for 3V 123A Battery (Battery not Included) Body Size : 4.3 x 1.8 x 1.4cm/ 1.7 x 0.71 x 0. Battery type: for 3V 123A battery (without battery). 3X(Color: Black. Note: Light shooting and different displays may cause the color of the item in the picture a little different from the real thing. ). Battery type: for 3V 123A battery (without battery). 10X(Color: Black. Note: Light shooting and different displays may cause the color of the item in the picture a little different from the real thing. ). Battery type: for 3V 123A battery (without battery). 5X(Color: Black. Note: Light shooting and different displays may cause the color of the item in the picture a little different from the real thing. ).